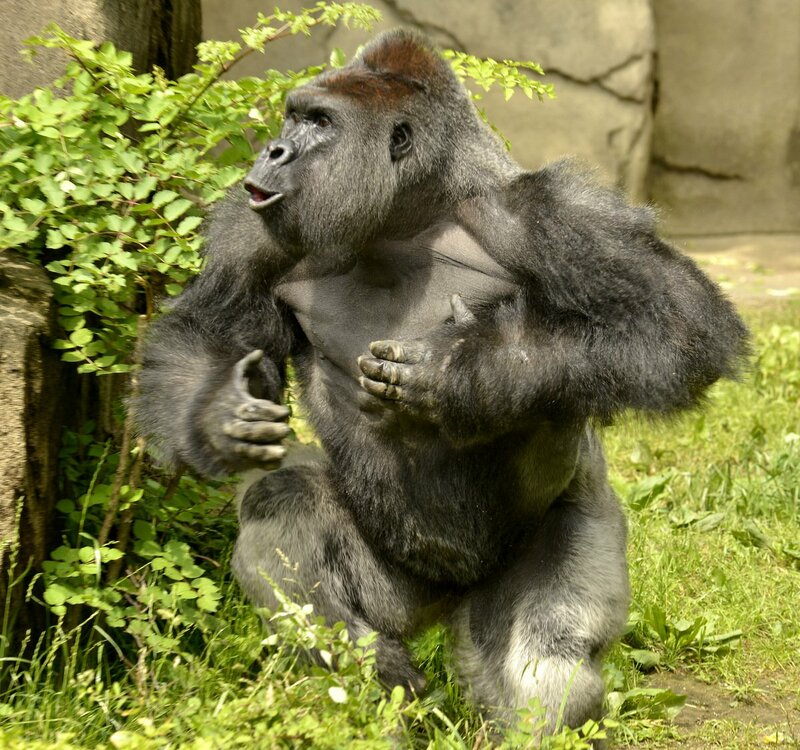 A holiday weekend outing at Cincinnati's zoo turned doubly tragic Saturday when a 4-year-old boy was hospitalized after falling into a gorilla enclosure - and zoo workers had to kill the rare gorilla to protect the boy. Cincinnati police and emergency crews responded to a report of a child falling into the exhibit at the Cincinnati Zoo & Botanical Garden at about 4 p.m. Saturday. Police confirmed the child was taken to Cincinnati Children's Hospital Medical Center near the zoo, and was treated for serious injuries that were not considered to be life-threatening. The Cincinnati Fire Department reported in a press release that first responders "witnessed a gorilla who was violently dragging and throwing the child." Maynard said the zoo's 17-year-old male western lowland gorilla, Harambe, grabbed the boy and dragged him around. Two female gorillas were also in the enclosure. The boy was with the 400-pound animal for about 10 minutes before the zoo's Dangerous Animal Response Team deemed the situation "life-threatening," Maynard said. The fire department release said the boy was in between the gorilla's legs at the time of the shot. Maynard said the Dangerous Animal Response Team followed procedures, which they practice in drills. He said in the 38-year history of the zoo's gorilla exhibit that they've never had anyone get into the enclosure. "It's a sad day all the way around," Maynard said. "They made a tough choice. They made the right choice because they saved that little boy's life. It could have been very bad." News of the incident triggered huge social media response. A video posted by the Enquirer had been viewed about 71,000 times at 9:30 p.m. Saturday. Many commenters criticized the parents of the boy for not watching him more closely. A Facebook group called Justice for Harambe was created and gathered more than 100 "likes" in less than two hours. "This page was created to raise awareness of Harambe's murder on 5/28/16," the page states. "We wish to see charges brought against those responsible!" The decision to shoot Harambe instead of tranquilizing was made in the interest of the boy's safety, Maynard said. He said that zoo officials have not yet spoken with the family of the child who fell into the habitat. Zoo officials will be reviewing the security of the enclosure and their procedures, but said they have no plans to stop the gorilla program. Harambe was born at the Gladys Porter Zoo in Brownsville, Texas before he was moved to Cincinnati in September 2014. Another gorilla, Gladys, named for her home zoo, also come to Cincinnati from Brownville. Western lowland gorillas are one of the four gorilla subspecies. According to the World Wildlife Foundation, populations of the critically endangered animal are hard to estimate due to the dense, remote rainforests where they make their home, but experts say between 175,000 to 225,000 could live in mostly in Congo, but also in Angola, Cameroon, Central African Republic, Equatorial Guinea, and Gabon. The zoo is open Sunday, but Gorilla World will remain closed until further notice.